Carolina Salvador, MD, talks with a patient at the UAB Comprehensive Cancer Center. UAB has opened Alabama's first Integrative Medicine Clinic to offer cancer patients alternative and complementary therapies to their medical treatment. Led by Carolina Salvador, MD, director of the UAB Integrative Medicine Clinic and assistant professor in UAB's Division of Hematology and Oncology, the clinic uses non-traditional treatments for a holistic approach to managing symptoms and side effects that can result from cancer treatments. "We care for the whole person - body, mind, spirit - using complementary therapies that include mindful meditation, spiritual and pastoral care, yoga and dance, among other treatments," Salvador says. "Our program complements what the oncologist and primary care physician does for the patient and family." The Integrative Medicine staff members don't focus just on the patient's disease. They bring in every resource available to help the patient heal while also enjoying a better quality of life. "We work with all aspects of a person and take care of their physical needs not correlated to the cancer treatment," Salvador says. "We evaluate them for stress, depression, fatigue, and spiritual concerns, and we also attend to their physical activities and sleep. We make sure they have adequate nutrition and that they are taking the correct supplements. We also offer nutrition classes where patients can learn to cook. We look at nutrition carefully, because food is the best medicine for fighting disease." A registered yoga teacher offers mindful, breath-centered yoga for fostering body awareness, building strength, and finding ease and balance. Kimberly Kirklin of the UAB Arts in Medicine program offers visual arts and guided meditation, dance and movement activities, storytelling and movement sessions, and singing and drawing classes. Drexel Rayford, director of the Support Team Network of UAB Pastoral Care provides spiritual support, compassionate listening, companionship and guidance to help meet each patient's practical, emotional and spiritual needs. A team psychologist treats patients suffering from physical illness and disability, bereavement, depression, or trauma-related issues. The psychologist incorporates meditation and mindfulness techniques that are designed to enhance the patient's well-being. Salvador, also an associate scientist with the UAB Comprehensive Cancer Center, wants to make sure people don't confuse integrative medicine with alternative medicine. "The difference with the UAB Integrative Medicine Clinic is that the patients will continue under the care of their primary oncologist or primary care physician. The integrative medicine specialists will work directly with each caregiver as a comprehensive team," she says. "While complementary therapies like yoga, massage, meditation and acupuncture can help with symptoms and side effects, many alternative cancer treatments are unproven or even dangerous." Salvador is seeing positive results from Integrative Medicine therapies. "Sometimes it takes a bit of time to change the way we do things, and it is not easy. It takes a lot of work on the part of the patients, but most of them see improvement in the way they sleep and the way they feel," she says. "Many patients see a reduction in pain and stress, and they suffer less." As integrative medicine becomes more widely used in the treatment of cancer patients, Salvador hopes it will become an integral part of treatment for all diseases. 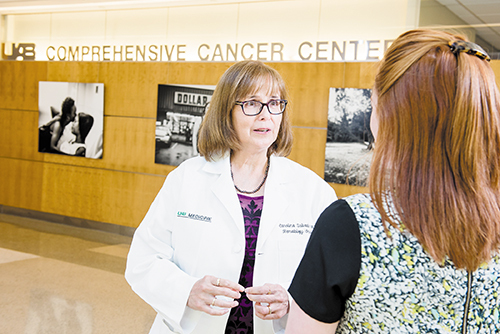 Marcia Howton, MD, recently joined the UAB Anesthesiology Department where she has started an integrative pain clinic and is working in collaboration with Salvador to provide comprehensive integrative care for people with cancer and chronic illnesses. "Most cancer and academic centers the size of UAB's already have some type of integrated medicine program in place. Our goal at UAB is to expand integrative medicine not only for treatment but for the prevention of diseases as well. We also want to provide all patients with a team to help them find the best modalities for fighting their illness," Salvador says. "What we have here at UAB is just the beginning. We have come a long way from the time I first started thinking about having an Integrative Medicine program. We have created the first true interdisciplinary Integrative Medicine Clinic in Alabama, and I am happy to be a part of this effort. I am thankful to the Cancer Center and UAB Medicine for supporting us."